Just back last night from the Worlds in Mendrisio, Switzerland. We stayed in Milan and took the train up for the two days of road races. A brute of a course but what an enjoyable weekends racing. First a bit about the setting and the course. 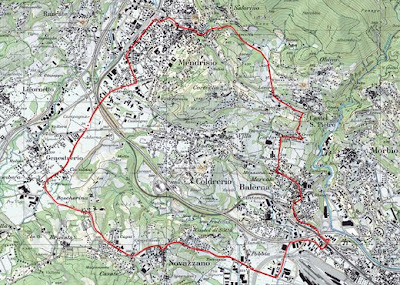 Mendrisio is in the Italian speaking part of Switzerland, only a few kilometers from the Italian border and Lake Como. It's not in the high mountains but sits in a valley with some pretty big hills on either side. The course made full use of the hills. After the start there was a slight descent followed by about a kilometer of flat road through the lower part of Mendrisio itself. A sharp right and left and the climbing started, up through the town and out onto the hill above to Castel St Pietro. A winding, fast descent brought the race back almost to the Italian border and to the bottom of the second climb, which ramped up in stages through Novazzano, past the vineyards above the town. Then a sweeping descent to the one kilometer to go mark and a slight drag to the finish. It was widely considered the hardest Worlds course for years. On Saturday morning, on the way to the Elite Womens race, we had to change trains in Chiasso station so grabbed a coffee and saw some of the race on TV in the station bar. We didn't see much but it was obvious that the green jerseys were hanging on the back on the climbs and so, surprisingly, was defending champ Nicole Cooke. We got to the course in time to catch the last third of the race. As the bunch passed us on the flat section through Mendrisio there was no sign of any green jersey. After a short wait Siobhan Horgan came down the hill in a group of three adrift of the field. We found out later that Olivia Dillon had already packed. We moved on up to the feed station to catch the field coming through the next time, led by the incredible multi World and Olympic champion Jeannie Longo-Ciprelli of France, 50 years old and still competing at the highest level. Unfortunately, Siobhan Horgan came through shortly after to retire from the race. We made it to the trade village behind the Start/Finish area in time to watch the very exciting last lap on a TV screen in one of the trade stands. The mostly Italian crowd were excited (to say the least!) to see one of their own win in convincing style. 3rd Noemi Cantele (ITA) s.t. I couldn't see the actual medal ceremony so this is the best pic I could get. I can now confirm that Ultra-marathon bike races are NOT a spectator sport! I spent a very frustrating evening driving the route in Wicklow trying to find some riders to cheer on. Unfortunately I got there too late to see the first two teams (Team No Prior Experience and An Post Connaught) pass through on their epic battle for the team prize. They finished a mere 40 minutes apart after 1324.5 miles of non-stop relay racing. Incredible. I started in Enniskerry and wound my way south along the route, stopping for a while in Glenmacnasse and Drumgoff hoping to see some lights down the respective valleys. No joy there! Everyone else was hours behind the two leading teams. Eventually, as it started to get a bit darker, I headed to Slieve Maan telling myself (and my wife at home!) that if I didn't see anyone coming there I'd call it a night. Happily I had just got to the summit when Team Tailteann appeared around the last bend of the climb. I jumped out, shouted some encouragement and at least got a pic of him. He was, understandably, struggling to get over the top but moving pretty well. Even better, after he went by there was another flashing light down in the valley below. About five minutes behind was the Swords CC rider similarly struggling up. His car pulled over to ask me the time gap and then on they went. I waited for a short while but no more lights appeared so I hopped into the car and followed down the descent. I was able to overtake the Swords rider on Drumgoff and got this shot of him passing the Shay Elliot Memorial. Now, apart from the spectator issue, the main thing that struck me about watching these guys was the loneliness of their effort. Despite having shared the riding most of the way around the country these guys were now tackling most of the hardest climbs in Wicklow, on their own, as the light faded. Apart from me there was no-one cheering them on. In fact I think I was such a rare sight both even managed a breathless "Thanks" as I cheered them past. I followed the Swords guy down the descent into Laragh. As he took it very carefully indeed in the fading light it made me really appreciate the sheer scale of what they were doing. And they, or their team mates, still had Sally Gap, Luggala, The Old Long Hill, Kilgarron in Enniskerry, the Devils Elbow in Glencullen and the Feather Beds to climb/descend through the night hours before the relatively flat final stretch around the edge of the city to Navan. Unfortunately I couldn't wait for Joe Barr to come up the climb. Word from the Swords car was that he was taking a rest in Aughrim so it would probably have been an hour or two before he'd have come up, in complete darkness. If that was tough for the teams I can't begin to imagine what it was going to be like for him and his fellow solo riders. Is it an advantage to not be able to see the road rise in the darkness, when you've ridden 1200 odd miles on a few hours sleep? See http://www.racearoundireland.com for the race website and http://www.justgiving.com/joebarr-racearoundireland/ to donate to Joe Barrs charity appeal. Got to see the last hour of yesterday fantastic Vuelta stage in Avila. What a win for Deignan!! Amazing. And beating someone like Kreuziger shows it was a class ride and not just a lucky break. The fifth Grand Tour stage winner from this little island and heading for the first top ten finish since Stephen Roche was 9th in the 1993 Giro. Well done Philip. Looking forward to cheering you on in Mendrisio next week. This week I've been watching a race online. Or more accurately I've been following the progress of a race by keeping an eye on the updated leader board. It reminds me of some soccer mad flat mates I had once who would spend Saturday afternoon watching the football on Ceefax because we couldn't afford Sky. The race I've been following is the incredible Ultra-marathon Race Around Ireland. It's basically a 1350 mile time trial around the island. One race, one stage, Navan to Navan, as fast as they can. Sleep is optional! 12 individuals and 11 teams started on Tuesday in Navan. According to the leader board two individuals have dropped out so far (it's Friday night now). All the teams are still on the road. The individual leader at the last time check was Italian Fabio Biasiolo, who passed Kinsale, having covered the 999.1 miles to Kinsale in 71hrs 44mins. However, according to the website, he's retired from the race in the last half hour "due to illness and physical considerations". (average speed 13.64ml/hr). Joe is trying to raise funds for a Northern Ireland childrens cancer charity so it'd be great if he could make it around. I'm awestruck by the strange mix of madness and heroism involved in a race like this. It's so crazy it's admirable! I mean one of the rules states that solo riders must stay on their bikes for at least 22 hours a day. I'm hoping to get to Wicklow tomorrow to see some of the riders pass through. If I catch any of them I'll try to get some pics to post up here. While I'm on the subject of dogs and bikes I have two more incidents to tell about. One was yesterday while I was passing through a semi pedestrianised road in the Phoenix Park, heading out on a 45 mile spin around North Kildare/South Meath. A man came from the left hand side ahead with a small Terrier type dog on a lead, crossing well in front of me. However, I could see another similar dog moving slowly behind him, and not paying much attention to me. He seemed to be an old dog from a distance, struggling along gamely. It looked like we were heading for an unplanned meeting if I didn't move out of his way. As I got closer the reason for his struggle became clear. The dog was in a wheelchair! No kidding, instead of a back leg he had a wheel contraption strapped on his rear end. I'm not sure if he had a leg or two missing, or if he had all his legs, but there was no doubt he was only using the front ones and pulling the rear ones on wheels. Fair play to the owners/vet. How many dogs would have been put down in similar circumstances? Coming back home later via Kilshane Cross, I avoided a shortcut because of a canine/bike encounter there a few months ago. I came around a corner, on whats essentially a narrow lane, to be greeted by a very large Alsatian relaxing right in the middle of the road. He was a guard dog that had obviously gotten out of a yard on the right hand side over night. Needless to say he wasn't very pleased to see me, nor me him for that matter. Given the narrowness of the lane I had no chance of turning around without him getting to me. I got the impression his bark might not be worse than his bite. There was only one thing for it. Break out the only weapons with any range aboard a bike, the full bottles. I let him have it right between the eyes from as near as I dare. The element of surprise worked. He stumbled back with a very confused look opening a way through on the road in front of him. As I made a sprint for it, in his haste he helped me out even more by falling backwards over a traffic cone he didn't spot behind him. Hilarious! Only after my Olympic standard sprint did I spot the truck pulled over to let me past, with the driver p***ing himself! I thought my heart was coming through my chest with the adreniline rush. Needless to say I'll be taking the long way around from now on. Riding a bike is one of the best ways to get out into the country and actually experience the environment. You get the smells, the sounds, the fresh air and the weather. Of course there can be a downside .... the wildlife. No cyclist is complete without their collection of shaggy, or should that be chasing, dog stories. Why country folk feel it's fine for Fido to play in the traffic is beyond me. It's not only a pain for the unsuspecting cyclist to have to suddenly switch to sprint mode when some mutt decides to dart out from his farmyard but it's dangerous too. I'm sure statistically there's not that many dog chasing bike related deaths or injuries but it feels like it sometimes. However this weekends spin turned out to be a more varied menagerie for me. For a change no dog races his week. Instead it was a wasp and some chickens! I was just heading out through Coolock when I met the wasp. Somehow it got under my collar. First I knew of it was the pain in my neck as the bugger stung me. I got him off pretty sharpish, without ending up in the traffic, but boy did it hurt. I haven't been stung since I was a kid and had forgotten how much pain there is. Thankfully there was no swelling or anything so I was able to go on. Later in the ride, in a lane near the Nags Head, I came across a rustic scene I've not seen for a long time. Chickens pecking around out on the road/boithrin! There was a small yard on the right with the gate open and about ten or so chickens and ducks wandering about. Three of them were out over towards the left side. As I approached one of them made a dash for the gate but the other two reacted later. Just as I got to them they decided they should run for it too .. right across in front of me. I don't think any dog has come so close to taking me down. But at least they weren't shouting (barking!) about it.